At my first Mount Hermon Christian Writers’ Conference, I was in the mentoring class taught by Gayle Roper. I really can’t recall how I came to choose Gayle’s class, but I’m certainly happy I did. As the time drew near for her to critique my work in front of the class, I thought of all the mistakes I’d seen her gently point out in the writing of others and realized that my submission contained examples of almost every one of these transgressions. But Gayle epitomized the lessons of I Corinthians 13. She was patient and kind, she didn’t keep score, and she didn’t delight in my shortcomings. Instead, she treated my work the same as she had that of others. She pointed out ways to improve the writing, and rewrote portions of the material to illustrate her points. In other words, she taught by example. Gayle’s latest novel is Fatal Deduction, and it’s apparent to me that Gayle is still showing by example. The first chapter not only hooked me, it demonstrated the way a master writer can reveal backstory and set a stage without resorting to the obvious. Here’s what I, as a novice writer, might have written four years ago: Libby Keating, an antique collector, had been forced to leave her comfortable home and move to Philadelphia, to a small house on a cobblestone lane. Gayle does it this way (writing in first person, which I find extremely difficult): I studied the block of Olde Philadelphia as I walked toward Aunt Stella’s house, the bags bumping and complaining their way over the uneven surface. I should be happy to be living here, being in the antiques and collectibles business as I was, but I guess no one likes having her life rearranged without her permission. Let me note here that Gayle didn’t ask me to post this, nor am I trying to ingratiate myself with the folks at her publishers. I just wanted to steer my readers to an excellent novel, one that is entertaining while modeling the way an accomplished novelist writes. And we all know that to write good novels, we need to read good novels. Fatal Deduction should be on that list. It was Saturday afternoon, and I was exhausted. I'd just climbed down off the bus, fresh from the book signing at Mall of America, where I'd been inundated by the sights and sounds of a mega-mall populated by a never-ending stream of people. Before that, there'd been a ninety-minute class, an appointment with an editor, and a hurried lunch. I didn't want to be around people. I didn't want to listen. I didn't want to be told my writing needed to be taken up a notch. What I wanted was a cold Diet Coke, a quiet place, and a soft bed. But I resisted the temptation. Instead, I attended a workshop by Susan May Warren on adding emotion to your writing. And I'm glad I went. We all know that fiction needs emotion to keep the reader's interest. But we can't just write, "Scott was angry." That's level one. Third grade writing, if you will. So, how about falling back on the use of adjectives. "Scott spoke angrily." Will that do it? Nope. Mark Twain suggested seeking out adjectives and killing most of them. Now we're up to high school level writing. Even if there weren't a label on the movie flyer above, it would be pretty easy to deduce that Adam Sandler and Jack Nicholson are angry. It's evident in their posture, their facial expressions. If we could see them in motion, we'd see that their actions are angry ones. That's what we need to do as writers. Try this for size: "Scott felt his collar grow too small. He balled his hands into fists and planted them on his hips. 'You can't mean that,' he spat." That's anger. I'm sure you can do better than that. I hope I could as well, given enough time, but maybe this example will be enough. Give the adverbs a rest. Convey emotions through the scene, the characters, the action. Put your reader in the character's mind and body. Show their emotion. That's good writing. At the recent ACFW meeting, I ran into Jeff Gerke. I first met Jeff when he was editor at NavPress. He reviewed one of my first novels in an appointment at Mount Hermon, and we both recalled how he tore it apart. But his critique was fair, and I learned from it. Now Jeff has started his own publishing house, Marcher Lord Press. If you write “speculative fiction,” check out his web site. At ACFW, I sat in Jeff’s class as he addressed the part of writing that many authors absolutely hate: writing a synopsis. I’m not sure I came out of the class with a magic bullet that makes synopsis writing a breeze, but Jeff did make a number of points that I believe bear emphasis. (For those who want more detail, Jeff's web site has a full explanation of the material he covered in the class). First, pay attention to format. We’re all told to do our manuscripts double-spaced, with one inch margins, in 12 point Times New Roman font. But the synopsis is an exception. It’s single-spaced. I’m not sure why, since it seems to me it would be easier to read in double-spacing, but I don’t set the conventions or make the rules. Further, Jeff feels the synopsis should be one page in length—maybe run over a paragraph into the second page, but no more. That’s tough! The synopsis should quickly reveal the setting and the genre of the story. It helps editors and agents keep the characters straight if their names are in all caps the first time they are introduced into the story—but just the first time. And yes, names are helpful. Not just “the protagonist” or the “female lead.” In the CBA, it’s also important to show the Christian content of the novel in the synopsis. Synopses are written in the present tense. They are meant to reveal only the high points of the story, and these should center on the journey of the hero: the starting point, the chief goal and obstacle, the moment of truth, and the resolution. And don’t forget to reveal the ending! This isn’t back-cover copy, meant to hook a reader. The synopsis is a tool that helps the editor sell the concept to a pub board, so don’t hold back. Since I’ve mentioned the hero’s journey, it gives me a chance to tell you once more about one of the books I believe every fiction writer should study: The Writer’s Journey, in which Christopher Vogler shows how most fiction works correspond to the structure of mythical tales. It’s not light, bedtime reading, but it’s worth studying. That’s enough for now. Come back again for more from the ACFW meeting. Thanks for dropping by. Kay and I returned yesterday from three whirlwind days at the annual meeting of the American Christian Fiction Writers. There are so many things to relate, but some of them will require a bit of reflection. I think I'll start with an event that I suspect represents a record of some sort: the mass book-signing at Mall of America. On Saturday, well over 100 authors who write for the Christian market boarded buses and made the trip from our convention hotel to Mall of America. I'm not unfamiliar with large malls. After all, I'm from Texas, and we have a number of them here. But this was sort of different. For those of you unfamiliar with this gigantic mall, it's not big...it's BIG. It has an amusement park inside, if that tells you anything. And on Saturday there were a bunch of people in the mall. We were set up in the rotunda and along one hallway, the tables butted together and back-to-back, a sea of authors sitting with display copies of their books, most with free bookmarks, many with candy and freebies. Some of the better-known authors took the stage in the rotunda to speak for brief periods. Most of us just sat at our tables and smiled as folks walked by. The idea was for people to buy our books at Barnes & Noble, then bring them to an author for an autograph. However, selling or signing books wasn't the chief purpose. We wanted the people in the mall to see what Christian authors looked like. There we were, young and old, every ethnic group represented, physicians and biophysicists sitting side-by-side with housewives and even a few students. We talked to lots of people. We let our writing and our lives witness. And if we reached even one or two of the multiple hundreds who stopped by, it was worth it. I autographed a few books, talked with a lot of people, got to know the authors around me better, and felt privileged to be in the company of some high-powered writers. All in all, it was a great experience. I'll post later this week about some of the things that happened to me at the meeting--good things, things that may be the first stirrings of a major boost to my writing future. Stay tuned. "Leavin' on a jet plane. Don't know when I'll be back again. Oh, babe, I hate to go." Like the words of Peter, Paul, and Mary's classic hit, Kay and I will soon be leaving on a jet plane, bound from DFW to Minneapolis and the annual meeting of the American Christian Fiction Writers. I'm planning on taking several classes and have appointments with a couple of editors, at least one of whom seems pretty interested in my most recent novel. Yet, in keeping with the lyrics of the song, I do sort of hate to go. I guess I have to agree with my fellow Texan, Nolan Ryan. "Anybody who thinks travel is glamorous ain't done enough of it." I'm a lifetime Platinum AAdvantage member because I've logged two million miles on American Airlines. I'm not particularly proud of it, it just happened. Since my retirement, I've gradually cut back on my travel, from what was once a schedule of three trips a month to a current one of perhaps four a year. Now I'm content to hang out at home, avoiding the lines at security, the almost inevitable flight delays, the agonizing wait for bags to come off the belt, the stress of navigating a rental car in a strange town or surrendering to a cabbie who appears to be auditioning for a demolition derby slot, the cold sweat I experience when wondering if my hotel room is going to be between the elevator and ice machine and below a room full of people practicing their clog dancing. If you've traveled much lately, maybe you'll identify to some extent. But on the plus side, I'm still sort of looking forward to visiting with people with whom I'm in frequent email contact but only see once a year or so. I anticipate the charged-up feeling I get when I'm around other writers, especially those who write for the same purpose I do: to fulfill a direct commission from God. And it will be nice to escape the Texas heat for a few days, although Kay and I have found that wherever we go, weather aberrations seem to follow us. So look out, Minneapolis. I predict unseasonably warm weather, interspersed with flooding rains, about the time our plane arrives Thursday. Got A Question? Read A Blog! In the past couple of days, two agents have posted excellent information about queries on their blogs. At Bookends, Jessica gives us a list of phrases to reconsider—read “avoid”—in your queries. I especially like the advice not to say, “Other agents have called the book….” No, there’s no reason to point out previous rejections. Agent Nathan Bransford has some advice about personalizing your query letter. How far can you go to appeal to the agent without appearing to be obsequious? Nathan even ranks a couple of ploys as to their appropriateness. It’s especially interesting to see him say, “For some reason I think there's an idea percolating out there that we agents want people to kiss our rings and tell us how great we are before we'll even look twice at a query.” Well, of course. So? Seriously, see what he has to say. I’ve already said that the first blog I open each day is that of my agent, Rachelle Gardner, but I also have bookmarked in my Google Reader the blog of agent Chip MacGregor, editor-turned-agent Terry Whalin, and Thomas Nelson CEO Michael Hyatt (where, on a sidebar tab, you can find a fairly up-to-date list of literary agents who represent Christian fiction). Should you only read agent blogs? No. There are a few editor blogs that I consult regularly. These are neat folks and they’ve been supportive of my efforts, but I don’t think I’ll list them specifically. Too much danger of leaving somebody off the list, and I want to stay in the good graces of all my editor acquaintances. Finally there are the author blogs and web sites. My Google Reader list contains too many to mention, and I’d probably forget somebody anyway, so I won’t try to list them all here. Just surf the net and you’ll soon find lots of blogs and web sites that contain great tips for writers. It always amazes me how willing most authors (not just those writing in the Christian genre) are to share their time and expertise with others. Not like lots of other professions. Well, that’s my bit of advice for today. Now it’s time to put what I’ve learned to work. Go and do thou likewise. But come on back. I may have something useful to say again soon. Hundreds of writers of Christian fiction are gearing up to attend the annual meeting of the American Christian Fiction Writers. Others are wishing they could go. The object of attending isn't just to fellowship with friends and colleagues. It's not even simply about the opportunity to take classes that will help them be better writers. The attendees, myself included, are hoping and praying that they will make a connection with an editor or agent that leads to the publication of their work. And that's as it should be. Those of us who write in the Christian fiction genre feel that we have a call to witness through our writing, and that requires the opportunity for others to read it. Of course, if the process involves a multi-book contract, a large advance, and some degree of fame--well, we can handle that. Or can we? Sunday's sermon by the pastor at our new church includes a lesson that each of us needs to remember. King Uzziah was successful and powerful, but eventually his power went to his head. When he usurped the prerogative of the priests by going into the temple and burning incense, he went too far. The priests warned him to stop, then watched in horror as Uzziah was stricken with leprosy before their eyes. The key verse in that story is 2 Chronicles 26:5. "As long as he sought the Lord, God gave him success." Success is fine. Power is great. Thinking you don't need God in the process is a recipe for disaster. I hope that each of my writing readers is successful in his/her efforts this year. I wish for each of you the opportunity to see your words in print, to have them witness to others and accomplish the purpose God has for them. But most of all, I pray that you will continue to seek the Lord, for only in that way is there any true success. It seems to me that I could spend all day just reading various blogs about writing, but if I did that I wouldn't get anything done, would I? I've shared some of those blogs with you already, but here's an interesting one. Today, agent Nathan Bransford gave a link to an excellent post by "Moonrat" on why you need an agent. For those of you who may look askance at the blog's title, let me explain that Moonrat (the pseudonym of the blogger--that's a moonrat in the picture) is an Editorial Assistant, which is generally abbreviated to the wording you see in the title. As for this particular post, we've all seen posts by agents listing the reasons why every writer should have an agent. It's neat to see some of the same reasons set forth by someone from the editorial side. The way she puts it, I sort of figure she's seen these scenarios play out. Speaking of blogs, the first one I open each morning is that of agent Rachelle Gardner. I don't know how Rachelle finds the time or patience to keep posting the wealth of information about publishing that you find one her site, but I'm happy to take advantage of her good nature by reading it all. Hope you'll do the same. Just wanted to pass this on. Have a great weekend. I've been late getting back to posting on my blog, but with good reason. We stumbled back into our new home at 1 AM this past Sunday morning, ready to fall into bed after traveling all day, only to be greeted by the sight of a portion of our ceiling sitting in the doorway of our bedroom, with water dripping onto the mess. Long story short, the air conditioner technicians installing our new system had disconnected and removed a humidifier from the old ductwork but had failed to properly seal off the end of the copper tubing, which had been dripping merrily in the attic for ten days or so. Fortunately, the air conditioning contractor stepped up to the plate and began putting things right the next morning. But it brought to mind what I heard a lot while I was growing up: "If it isn't one dad-durned thing it's another." Now if that's the extent of the swearing I did after going through this, I think I've done pretty well. But that brings up the real subject of this post: profanity in the creative arts. Kay and I are absolutely hooked on the TV program, The Closer. The plotting is excellent, the action is continual, but amazingly enough, there is no profanity on the program, even though it's a cable show. (And we all know how cable shows, like some of those on HBO, like to show off their freedom of expression). Some of my favorite secular authors stray into the use of blue words from time to time, but the best ones are able to convey their meaning without that device. No, profanity is real-world, all right, but it's not necessary to add to what's already out there when we write to get our point across. And there are examples aplenty to prove it. 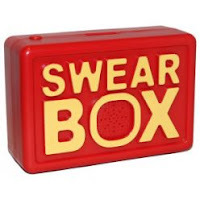 The device pictured above is a "swear box." The idea is that, when you swear, you put in a coin and the device gives forth with a bunch of bleeped-out profanity. Sounds like fun...for the first couple of times. After that, I suspect it would get sort of monotonous. But then again, conversation and writing laced with profanity falls into the same category. Oh, well. I'm back at work, the repairs on our house are going along, and I'm about to watch some more politics on TV. There won't be any profanity from the podium, but before this election is over I imagine there will be a few choice words directed at the candidates over the morning paper by lots of folks. Every time that happens, drop a quarter in a jar. Then put the proceeds in the collection plate next Sunday. Better than a swear box.